Asparagus season is still going strong, and I’m eating up while I can. 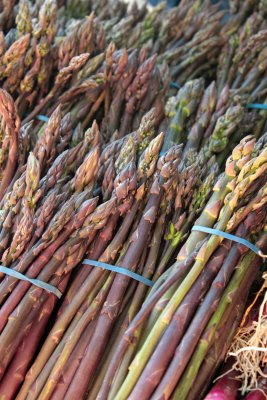 Now the purple asparagus has made its appearance at the farmers market. I had to get some just because it’s so pretty. It’s fun to watch it turn magically from purple to green as it cooks. Heat a large, heavy sauté pan over medium heat until very hot but not smoking. Add the butter and cook for 3 to 4 minutes, or until browned. Add the asparagus, chives, parsley, and thyme and sauté for 2 to 3 minutes, or until the asparagus is heated through. Toss in the lemon juice and season to taste with salt and pepper. Transfer to a platter and serve immediately. Serves 2 to 4 as a side dish. Just as tasty with green asparagus. 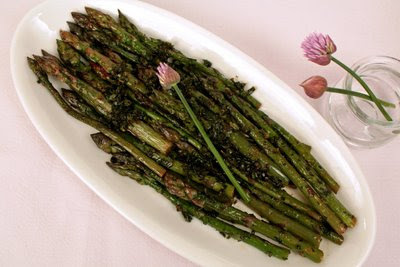 I love asparagus, just love it. I have had only the white and green, never purple. Beautiful. Just had purple asparagus for dinner tonight ourselves, only grilled though, I'll have to try the brown butter sauce next time. Wow that asparagus shot is pretty! Shape, texture, color, composition; it's just a great shot!